"Here in the place where you live." James Luna's new bilingual book uses rhymes and refrains to celebrate a love of home, of neighborhood and of family. 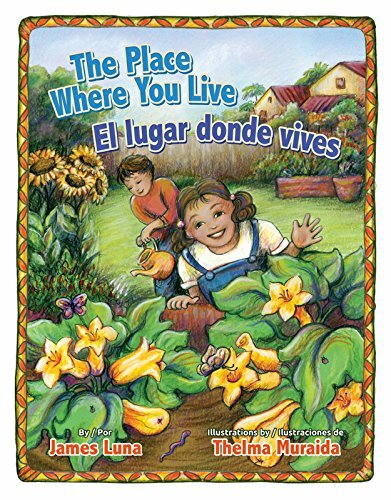 With colorful illustrations by Thelma Muriada, this book moves from the kitchen to the garden, and from school to parks delighting in what children and families do together. At the end of the day, Mamá and Papá hug you tight because "You make them so glad." 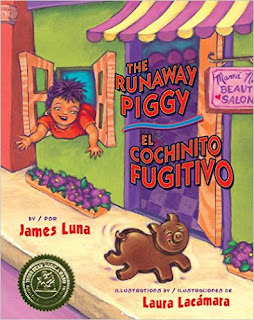 A Mexican piggy cookie escapes from the bakery before it can be eaten and eludes an ever-growing line of people pursuing it. Includes recipe for piggy cookies. 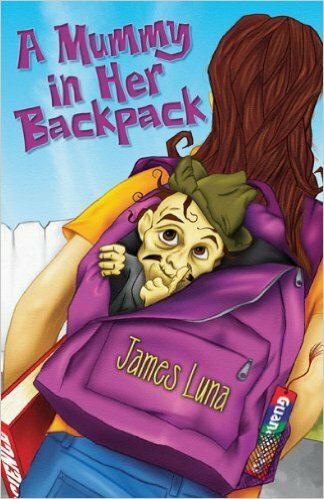 Flor returns to school from a vacation in Mexico, only to find she brought back a small man with dark yellow skin and thin, stringy hair, who emerges from her backpack and introduces himself as Rafa, a mummy from the famous museum in Guanajuato.